4x12 Wicker Oil Rubbed Bronze Floor Register Discounts Apply ! 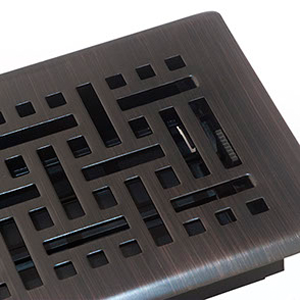 Be amazed by our oil rubbed bronze registers and their one step installation process. Your needs for floor heating covers that will allow you to control the airflow in your home have finally been met. Our oil rubbed bronze register is made with a firm steel core and can hold up to 200 pounds. 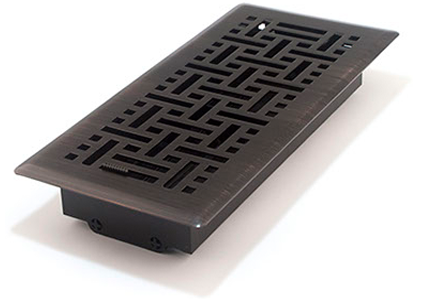 This floor heating cover is plated in oil rubbed bronze and will add value to any space. A unique lacquer coating protects the oil rubbed bronze register against deterioration or tarnishing. These floor heating covers can also be used for any cooling purposes. ***Hint: When ordering for the oil rubbed bronze register, make sure you measure the actual hole opening in the floor. Industry standards follow this rule and recommend that you do not measure your existing register faceplate. Our floor heating covers come in various sizes and also a range of finishes. Try these oil rubbed bronze registers today and see what a difference they can make.